Tag Archive | "Camp Grayling"
As a Coast Guard rapid response team stormed a ship taken by “terrorists” in Lake Huron, Marine Corps Reservists were conducting infantry maneuvers with a group of soldiers from the Denmark Home Guard. At the local hospital, an incident command center had been stood up as civilian doctors and nurses communicated with sheriff deputies about the possibility that some kind of radiological dirty bomb had been detonated in town—discovered by a specialized team from the Indiana National Guard. In short, it was just another day at Camp Grayling. “The complexity of this exercise shows the capacity that we enjoy here at Camp Grayling,” Major Gen. Gregory Vadnais, the adjutant general of Michigan, explained as he stood outside a decontamination tent at Munson Healthcare Grayling Hospital in the northern Michigan city of Grayling. This exercise is Arctic Eagle 16, a National Guard-led exercise focusing on emergency response to a terrorist incident on American soil. Arctic Eagle brought some 1,100 troops to the Camp Grayling Joint Maneuver Training Center for about two weeks in early April amid a late season snowstorm that dropped temperatures below zero and dumped six or more inches of snow on the region, and complemented the exercise’s Arctic name. But this exercise was just one of a series of events that brought nearly a quarter million troops to the camp in Fiscal Year 2015. Which explains why, on the day Vadnais and several other general officers visited the troops in the field during Arctic Eagle, a senior Coast Guard officer was with the group—on an Army National Guard camp some 75 miles from the nearest coastline. 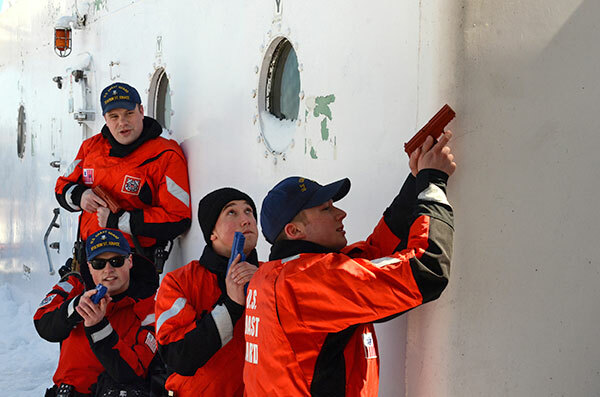 In the Arctic Eagle scenario, Coast Guard and National Guard troops from Michigan and Massachusetts used a museum ship in Mackinaw City, Mich.—the former US Coast Guard Cutter Mackinaw—to stage a series of attacks and counter-attacks on the ship. The troops worked closely with the owner of a privately owned industrial shipyard in nearby Cheboygan to stage the raid. The fact that Cheboygan County Sheriff Dale Claremont is also a sergeant major in the Michigan Army National Guard helped to ensure smooth coordination between the military units and the locals in Mackinaw City and Cheboygan. As that was happening in Cheboygan and Mackinaw City, at Camp Grayling’s Combined Arms Training Facility, Marine Corps Reservists from the 3rd Battalion/25th Marines based in Johnson City, Tenn., were focused on another aspect of Arctic Eagle—providing security and response to seek out the “terrorists” in the exercise. Working with the Marines were some 80 members of the Home Guard of Denmark, a volunteer unit somewhat similar to the U.S. National Guard. “This is an opportunity for our Marines to not only work in conjunction with other units, but to gain some great cultural training by working with the Danes,” said Lt. Col. Ford Philips, inspector/instructor for 3rd Battalion. “The Marines are not only working on their skills as infantry, but learning a lot about another culture and how they view military service. For one of the Danish Home Guard troops, the Camp Grayling training has particular relevance. Pvt. A.J. Manzon said he had a friend who was in Brussels, Belgium, during the March 22, 2016, terror attacks there. Working with partner organizations—both at the local level and internationally—is a core competency of the National Guard, Vadnais said. Those partnerships benefit not only the National Guard and related agencies, but the medical professionals at the community hospital in Grayling. Among the 1,100 troops supporting Arctic Eagle 16 was an Indiana National Guard soldier on her first major exercise. Private 1st Class Rakiya Lyons was part of the team that helped create the emergency decontamination treatment center near the simulated bomb blast site. “Seeing how it all really comes together, seeing how the parts of the team all work together—it’s really something,” Lyons said. Arctic Eagle 16 is a National Guard led, joint, interagency, intergovernmental, and multinational exercise based on the President of the United States, Department of Defense, Department of Homeland Security, state of Alaska and international partners’ Arctic strategies. It is conducted in live and constructive environments, focused on humanitarian assistance, consequence management and infrastructure protection.